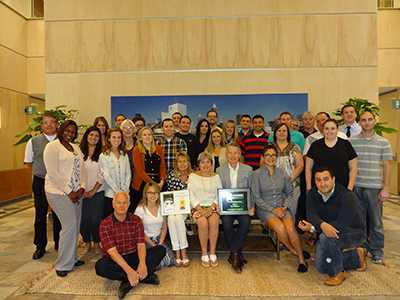 Independence, Ohio, July 2, 2015: Merrymeeting Group based in Independence, OH, is proud to be announced as one of Northeast Ohio’s Top Workplaces in 2015. 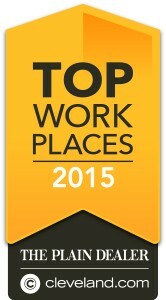 The Cleveland Plain Dealer announced their sixth annual Top Workplace awards on June 21, 2015. The Top Workplace awards are based on annual survey results conducted and analyzed by Workplace Dynamics, an independent workplace consulting firm. Surveys reveal that organizational health based on a combination of effective leadership, pay, benefits and meaningful work remain key issues. Yet regardless of the industry or the size of the company, surveyed employees across the board voiced similar desires for the following workplace attributes: engaging community service projects supported by the employer; interesting and imaginative employee perks; a work environment where each and every employee feels valued and respected. “Clearly our staff appreciates Merrymeeting Group’s hands-on engagement and support for community organizations such as Metanoia Project, Achievement Centers for Children and the Cleveland Food Bank. Plus our group activities such as free weekly yoga classes, our annual relay marathon race, complimentary sports tickets and theater nights, allow our hard working team to enjoy themselves,” added John Davies. Workplace Dynamics selected the Top Workplaces based on the analysis of over 42,000 employee surveys for responses to 22 questions that measure a range of factors including satisfaction regarding management, salary and work/life balance. At small and large companies alike, when it comes to hiring and retaining the top talent in any industry, the Top Workplace logo on a company’s website sends a valuable message to both current employees and job seekers. Merrymeeting Group was founded in Cleveland in 2001. Since its inception, Merrymeeting Group has focused on the acquisition and development of intellectual property driven businesses in the franchising, technology and B-To-B service sectors. The Merrymeeting Group portfolio includes a diverse group of interrelated businesses focused on building a supportive network of industry expertise with specialties ranging from franchise companies to software and business services. The strength of the portfolio lies within its ability to create strong, inter-connected business networks. Currently included in Merrymeeting Group’s portfolio of businesses are the following: Belong Suite; CPR Cell Phone Repair; Computer Troubleshooters; Geeks On Call; Frontier Adjusters; Inspect-It 1st; MTO Clean; Pro Energy Consultants, Staff Trak; and Sunbelt Business Brokers. To learn more about Merrymeeting Group, see https://www.merrymtggroup.com/. Workplace Dynamics partners with more than 40 leading publishers across the country to produce regional Top Workplaces lists. These lists recognize great companies based purely on the opinions of the people who work there through employee surveys. This vote of confidence is a powerful indicator to shareholders, customers and the community that the organization has strong values underpinning its behavior. Workplace Dynamics is based in Exton, PA.